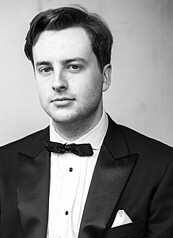 Lyric-baritone Daniel Carison is one of Australia’s most promising young singers. A graduate from The Conservatorium of Music Melbourne, Daniel is the winner of the Royal Melbourne Philharmonic Aria Competition and one of the inaugural winners of 3MBS’ The Talent. In 2017 Daniel was a third time recipient of the Paulette Bisley and Ruskin Opera awards with the Melba Opera Trust. Daniel commenced his performance career initially in the area of musical theatre starring roles such as Tevye in Fiddler on the Roof and Henry Higgins in My Fair Lady. Daniel was awarded Best Male actor in a leading role in 2011 by the Victorian Theatre Guild. Some of his most celebrated performances include Schubert’s Winterreise, Schwanengesang, his live to air performance of Schumann’s Dichterliebe and of course the World Premiere of Cassomenos’ Requiem for the End of Time. Operatic credits include Balthazar in The Play of Herod, Pandolfe in Cendrillon, The Mayor in The Pied Piper and most recently his role and international debut as Papageno in Die Zauberflöte with the Malaysian Philharmonic. In 2017 Daniel completed the final chapter of his Schubert trilogy with a number of performances of Schubert’s Die Schöne Müllerin throughout Melbourne. On 12 August 2017 he received the German-Australian Opera Grant in Melbourne and will depart to Germany in May/June 2018 to become part of the professional ensemble at the Hessisches Staatstheater in Wiesbaden for one year.